Contract Management standards are developed for two primary reasons – reduce risk and increase efficiency. Over time, as applications get introduced and technology improves, those standards may have morphed into something very different due to limitations in software. Workarounds are developed, concessions are made and before you know it, those changes become the accepted norm within the organisation. Worse still, those workarounds and adjustments seldom stand up to scrutiny in protecting your organisation from not fulfilling contract terms. Are we doing things the right way? Are we getting the right information to make decisions? Are we increasing our efficiency? 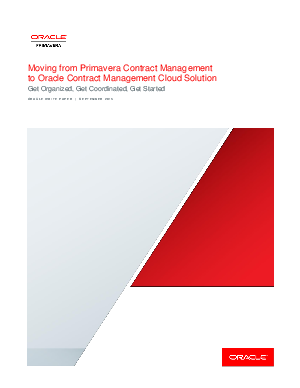 Download Oracle’s Primavera Whitepaper to find out how Primavera Unifier’s granularity supports the entire team’s participation while giving your organisation the peace of mind that critical data is protected and accessed by authorised users.